I was going through some old pictures of previous summers at camp. This one's always been one of my favorites. 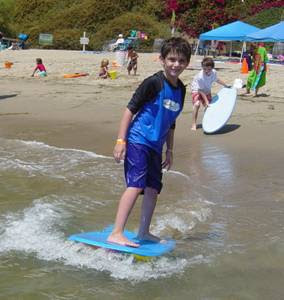 This camper is enjoying our "surfing on the sand" activity (which actually uses boogie boards rather than surfboards). Here's how it works. For this activity, kids take a running start while tossing their boogie boards onto the wet sand several feet in front of themselves. They chase after the board and hop onto it once they catch up. Our campers love this activity, especially at Keiki Camp, but it's great for kids of all ages.